In sports car racing, production derived versions of sports cars also known as grand tourers , and purpose built sports prototype cars compete within their respective classes on closed circuits.The premier championship series of sports car racing is the FIA World Endurance Championship. The main series for GT car racing is the FIA GT1 World Championship. There is also the FIA GT3 European Championship as well as the less powerful GT4 European Cup. Previously, an intermediate FIA GT2 European Championship existed, but the FIA dropped it to cut costs. Other major GT championships include the Japanese Super GT championship and the International GT Open for GT2 and GT3 cars. There are also national GT championships using mainly GT3 and GT4 cars featuring professional and amateur drivers alike. Sports prototypes, unlike GT cars, do not rely on road legal cars as a base. They are closed wheel and often closed cockpit purpose built race cars intended mainly for endurance racing. They have much lower weight and more down force compared to GT cars making them much faster. They are raced in the 24 hours of Le Mans and in the Le Mans series, Asian Le Mans Series and the United SportsCar Championship. These cars are referred to as LMP cars with LMP1 being run mainly by manufacturers and the slightly less powerful LMP2 cars run by privateer teams. All three Le Mans Series run GT cars in addition to Le Mans Prototypes; these cars have different restrictions than the FIA GT cars. One make, or single marque, championships often employ production based cars from a single manufacturer or even a single model from a manufacturer s range. There are numerous notable one make formulae from various countries and regions, some of which such as the Porsche Supercup and, previously, IROC have fostered many distinct national championships. Single marque series are often found at club level, to which the production based cars, limited modifications, and close parity in performance are very well suited. Some of the better known single make series are the Mini 7 Championship , the Radical European Masters, John Cooper Mini Challenge, Clio Cup, Ginettas, Caterhams, BMWs, and MX5s. There are also single chassis single seater formulae, such as Formula Renault and Formula BMW, usually as feeder series for senior race formula . In North America, stock car racing is the most popular form of auto racing.Primarily raced on oval tracks, stock cars vaguely resemble production cars, but are in fact purpose built racing machines which are built to tight specifications also called Silhouette racing cars. The 2012 FedEx 400 NASCAR Sprint Cup Series race at Dover International SpeedwayThe largest stock car racing governing body is NASCAR (National Association for Stock Car Auto Racing). NASCAR s premier series is the Sprint Cup Series, its most famous races being the Daytona 500, the Southern 500, the Coca Cola 600, and the Brickyard 400. NASCAR also runs several feeder series, including the Nationwide Series, and Camping World Truck Series (a pickup truck racing series). The series conduct races across the entire continental United States. The NASCAR Canadian Tire Series conducts races across Canada and the NASCAR Toyota Series conducts races across Mexico. NASCAR also governs several smaller regional series, such as the Whelen Modified Tour. Modified cars are best described as open wheel cars. Modified cars have no parts related to the stock vehicle for which they are named after. A number of Modified cars display a manufacturers logo and vehicle name , yet use components produced by another automobile manufacturer. Rallying at international and most national championship levels involves two classes of homologated road legal production based car; Group N Production cars and more modified Group A cars. Cars compete on closed public roads or off road areas run on a point to point format where participants and their co drivers rally to a set of points, leaving in regular intervals from start points. A rally is typically conducted over a number of special stages on any terrain, which entrants are often allowed to scout beforehand at reduced speeds compiling detailed shorthand descriptions of the track or road as they go. These detailed descriptions are known as pace notes. During the actual rally, the co driver reads the pace notes aloud (using an in helmet intercom system) to the driver, enabling them to complete each stage as quickly as possible. Competition is based on lowest total elapsed time over the course of an event s special stages, including penalties. The top series is the World Rally Championship (WRC), first contested in 1973, but there also regional championships and many countries have their own national championships. 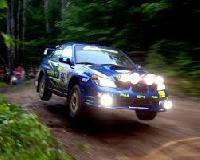 Some famous rallies include the Monte Carlo Rally, Rally Argentina, Rally Finland and Rally GB. Another famous event (actually best described as a rally raid ) is the Paris Dakar Rally, conceived in 1978. There are also many smaller, club level, categories of rallies which are popular with amateurs, making up the grass roots of motor sports. Cars at this level may not comply fully with the requirements of group A or group N homologation. As well as the WRC other major rally events include the British Rally Championship, Intercontinental Rally Challenge, African Rally Championship, Asia Pacific Rally Championship and endurance rally events like the Dakar Rally. In drag racing, the objective is to complete a given straight line distance, from a standing start, ahead of a vehicle in a parallel lane. This distance is traditionally ? mile (400 m), though ? mile (200 m) has become popular since the 1990s. The vehicles may or may not be given the signal to start at the same time, depending on the class of racing. Vehicles range from the everyday car to the purpose built dragster. Speeds and elapsed time differ from class to class. Average street cars cover the ? mile in 12 to 16 seconds, whereas a top fuel dragster takes 4.5 seconds or less, reaching speeds of up to 530 km/h . Drag racing was organized as a sport by Wally Parks in the early 1950s through the NHRA (National Hot Rod Association). The NHRA was formed to discourage street racing. When launching, a top fuel dragster will accelerate at 3.4 g (33 m/s? ), and when braking parachutes are deployed the deceleration is 4 g , more than the Space Shuttle experiences. A top fuel car can be heard over 8 miles (13 km) away and can generate a reading from 1.5 to 3.9 on the Richter scale. Drag racing is two cars head to head, the winner proceeding to the next round. Professional classes are all first to the finish line wins. Sportsman racing is handicapped (slower car getting a head start) using an index (a lowest e.t. allowed), and cars running under (quicker than) their index break out and lose. The slowest cars, bracket racers, are also handicapped, but rather than an index, they use a dial in. In off road racing, various classes of specially modified vehicles, including cars, compete in races through off road environments. 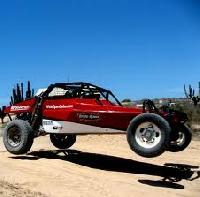 In North America these races often take place in the desert, such as the famous Baja 1000. In Europe, offroad refers to events such as autocross or rallycross, while desert races and rally raids such as the Paris Dakar, Master Rallye or European bajas are called cross country rallies. The modern kart was invented by Art Ingels, a fabricator at the legendary Indianapolis car manufacturer Kurtis Kraft, in Southern California in 1956. Ingels took a small chainsaw engine and mounted it to a simple tube frame chassis weighing less than 100 lb. Ingels, and everyone else who drove the kart, were startled at its performance capabilities. The sport soon blossomed in Southern California, and quickly spread around the world. Although often seen as the entry point for serious racers into the sport, kart racing, or karting, can be an economical way for amateurs to try racing and is also a fully fledged international sport in its own right. A large proportion of professional racing drivers began in karts, often from a very young age, such as Michael Schumacher and Fernando Alonso. Several former motorcycle champions have also taken up the sport, notably Wayne Rainey, who was paralysed in a racing accident and now races a hand controlled kart. As one of the cheapest ways to race, karting is seeing its popularity grow worldwide. As modern motor racing is centered on modern technology with a lots of corporate sponsors and politics involved, historical racing tends to be the opposite. Because it is based on a particular era it is more hobbyist oriented, reducing corporate sponsorship and politics. Events are regulated to only allow cars of a certain era to participate. The only modern equipment used is related to safety and timing. A historical event can be of a number of different motorsport disciplines. Notably some of the most famous events of them all are theGoodwood Festival of Speed and Goodwood Revival in Britain and Monterey Historic in the United States. Championships range from grass root Austin Seven racing to the FIA Thoroughbred Grand Prix Championship for classic Formula One chassis.